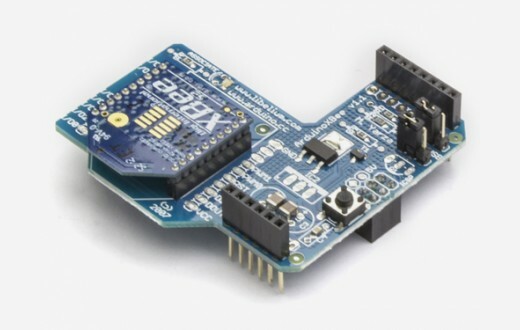 The Xbee shield allows an Arduino board to communicate wirelessly using Zigbee. It is based on the Xbee module from MaxStream. The module can communicate over to 30m in closed ambient and over 80m in open ambient (without obstacles). It can be used ad Serial/USB converter ad used through command line and configured to work in mesh, broadcast. The Xbee's pinout is matched to a standard perfboard and others shield is designed in collaboration with Libelium who developed it for the SquiddBee motes to create a sensors network. The board is pre-assembled (Arduino board not included).